Experienced Naturalized American Sean Anthony (193-F-86) had an amazing evening in the last round for league's leader Global Port and that's him to receive a Interperformances Player of the Week award for round 1. The 32-year old forward had the game-high 22 points adding nine rebounds and five assists for Global Port in his team's victory, helping them to beat NLEX RW (#11, 0-2), the league's bottom-ranked team 95-90. It allowed Global Port to jump to the first place in the Filipino PBA. But it's just the very beginning of the season and Global Port won both games without losing any. It's too early to say anything as the standings can be changed completely after next round. In the team's last game Anthony had a remarkable 58.3% from 2-point range. It's his second year at Global Port and it's hard to imagine this team without him. The second most remarkable performance in last round's games was 29-year old German forward Christian Standhardinger (206-F-89) of SM Beermen. Standhardinger impressed basketball fans with 26 points, 6 rebounds and 3 assists. Of course SM Beermen cruised to a 99-91 relatively comfortable win over Ginebra Kings (1-1). The season is still at the very beginning and this victory may help a lot. Let's wait for the next round. Standhardinger is well-known by SM Beermen fans and he already established his position as one of team's most reliable players. 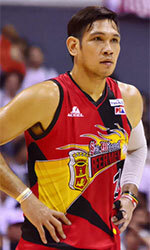 The third best performed player last round was another SM Beermen's star - Filipino Arwind Santos (193-F-81). Santos got into 30-points club by scoring 34 points in the last round. 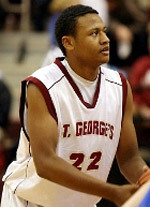 He went also for seven rebounds . Despite Santos' great performance SM Beermen lost 118-124 to Columbian Dyip (#3, 1-0). But his team cannot count on just these two top stars as they also need help of the other teammates. The last thing SM Beermen needs is to lose another game like this one. They lose more and more distance to the top teams. Their record is 1 victory and 1 lost game. Santos has a very solid season. In 2 games in Philippines he scored 20.0ppg.